Here is an interview I did with Rachel Glass for Evergreen Radio/WTBBL in Seattle last year, before the motherhood explosion, when the conversation was really about Japan and the atomic bomb and writing. It’s quite interesting to go back in time. When Rachel and I sat down, we discovered, of all things, that her parents knew my parents in the old days in Hawaii. It is, especially in the islands, a very small world. The MP3 link is here. but it is not gone from our hearts. 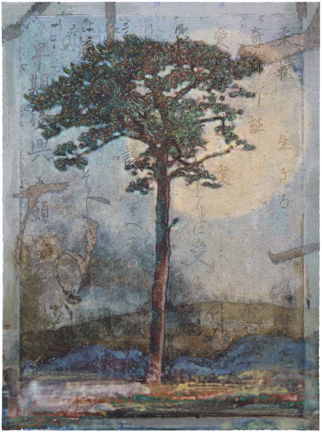 Donald & Era Farnsworth’s Sacred Pine depicts a pine tree in Rikuzentakata, Japan, a coastal city almost completely flattened by the tsunami following the 2011 Touhoku earthquake. Incredibly, this single pine was left standing from a grove of more than 70,000 trees planted along the shore three centuries ago; the tree has emerged as a symbol of hope and renewal in an otherwise devastated region. For more information, to purchase or make a donation, (or to investigate my tiny connection to this beautiful work) click here.